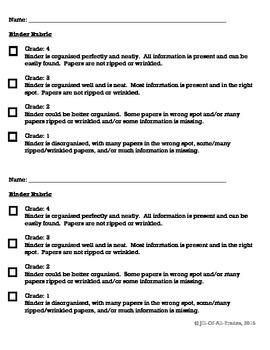 A quick assessment for student binder organization and note-taking. Made for grade 4, could be used for grades 3 or 5. Uses a 1,2,3,4 scale to evaluate. Be sure to follow my TpT store by clicking on the red ‘Follow Me’ next to my Seller picture to receive notifications of new products and upcoming sales.